After today’s post on my Floating Caddis-Mayfly Emerger I received two requests for tying steps to make this fly. So reblogging this original post; here they are, from my article dated May of 2013. Lots of fishing pics, info on the day, tactical stuff, etc. Note to interested tiers: Both the Orvis version with the wound hackle collar, and the MyFlies.com version with side-lashed legs are here. See the notes on that below the MyFlies.com Hi-Vis Emerger. This article is Part II of the Floating Sulphur Emerger pattern. This season on Spring Creek, using my Floating Caddis – “Sulphur” Emerger, I decided to try something new and different; that is; fishing with two dry flies at the same time, in a tandem dry fly rig. I had done that successfully out west in 2006 on the Madison, using my Floating Caddis Emerger trailed on 5x tippet behind a #10 Grizzly Wulff as an indicator fly. I did this so I could see the Emerger on the broken water, plus to provide better visibility and improved tracking of the smaller, flush-floating emerger at distances of forty to fifty-five feet that I was occasionally casting. This pattern was created in 2006, a revised fly that began in 1996 with my original Hatching Caddis Adult pattern. It has been field-tested in Pennsylvania; on Penn’s Creek, Big Pine Creek, and Spring Creek. I also used it successfully on the Beaverkill in New York, and Montana’s Madison River, and my brother has used it on Maine’s Penobscot River for land-locked salmon. It has also proven itself as a very effective still-water fly. Since its release with Orvis, a customer and his wife from Massachusetts, who guide with the 2014 Orvis Guide of the Year, Tim Linehan, used it on the Missouri River in 2013 and hammered ’em. Tim had not seen the pattern previously and was surprised by its success. He bought some from me afterward. 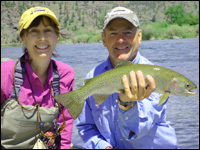 Sue Ukena and Orvis 2014 Guide of the Year, Tim Linehan, with a Missouri River rainbow that fell to Bastian’s Floating Caddis Emerger. I also wanted to get the fly on the MyFlies.com site, but could not in good conscience place the same pattern there. So I made two changes in the pattern, number one, the way the hackle is applied. On the MyFlies.com version, Bastian’s Floating Caddis / Mayfly Emerger, I side-lash the legs. And number two, I added a chartreuse foam indicator to the top of the fly and the neck, between the body and head section. This helps improve visibility of the fly, which rides on the surface. It is called an emerger, but this fly is actually a dry fly, even though it is unconventional in its appearance as a dry fly. Another thing about it, even if swamped by surface turbulence, it remains in the film. That is why the hi-vis indicator is helpful. Plus I have successfully for the last three seasons, doubled-up and used a tandem dry fly rig with this pattern; a sulfur dun and a ginger colored “sulfur” version of Bastian’s Floating Caddis / Mayfly Emerger. The larger, high-floating, more visible dun pattern keeps your eye tracking the drift of the emerger as well. Trout flash, swirl, boil, or just show themselves under the dun, and they are generally always looking at, or most times, have taken the emerger. This is why I have trained myself to be quick to strike at any sign of a trout. Even with just 10″ of tippet between the dun and emerger, the dry fly does not always give indication that the trout took the emerger. They are faster and quicker on the “take and spit” than most of us ever realize. There are about ten or eleven articles here on my blog related to this pattern. Use the search tab, type in “Floating Emerger,” hit the enter key and they will come up. Lots of photos, success stories, tactical stuff, tying instructions…it’s all there. 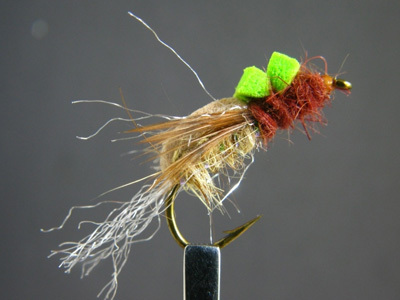 This is the ginger-colored version of Bastian’s Floating Caddis / Mayfly Emerger. This fly KILLS on Spring Creek and any stream where the sulfurs, phemerella rotunda exist.